Every year we the con goers completely take over 5 host hotels. The Sheraton, Westin, Hyatt Regency, Marriott Marquis and Hilton. The hotels are all AMAZING to the onslaught of us the gaggle of nerds. 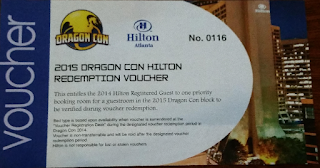 Dragon Con has a contract with the hotels that on their internal TV station they run Dragon Con TV. Dragon Con TV is run 24 hours a day throughout the con. Lots of random skits and the morning info show. They even do parodies of current music. Pretty cool when you are in your room getting ready in the morning and have it on in the background. Considering there are 40,000 plus con attendees plus staff, and guests that puts us over 50,000 people. Not everyone stays in the host hotels, but they are FULL. The hotels also have contracts with other folks to allow for other non con attendees to be there as well. With all of us, the staff at all of the hotels is absolutely stellar. I have never had a bad staff experience. Some are meeh but never a BAD one. 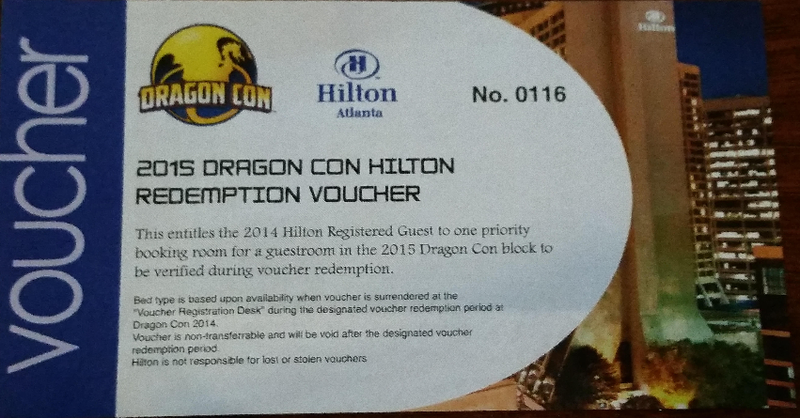 The hotels even design their room keys especially for Dragon Con. Pretty neat. The Hilton even has some of their staff dress up as a greeting committee. They provide snacks and water while you are in the registration line. For all of the trouble we may cause and all of the chaos that comes with us, I think the host hotels do a fantabulous job. The Hyatt has even sent an email this year that lets their guests register for the con next year at their registration in a couple of weeks. WOO HOO. Last year the Hilton did something of the similar. I hope they do it again. To all of the staff of the hotels, thank you for making us feel so welcome.